Monsi Roman and representatives from the companies partnering with NASA announce Phase 2 of the habitat challenge at Maker Faire in New York City. NEW YORK — Put on your thinking caps! NASA has announced Phase 2 of its 3D-printed habitat challenge, focused on creating a living space for astronauts on the Red Planet. The announcement was made here at Maker Faire New York Saturday (Oct. 1), exactly a year after the winners of Phase 1 were revealed. In Phase 1, competitors were challenged to dream up and design a structure that could be 3D printed using resources already available on Mars. While Phase 1 was about architecture, Phase 2 is about construction. It asks competitors to "demonstrate a recycling system that can create structural components using terrestrial and space-based materials and recyclables," according to NASA's Centennial Challenges website.Competitors in this phase will need to build a system that can actually make the materials needed to build the structures dreamed up in Phase 1. For example, first place in the first phase went to Team Space Exploration Architecture and Clouds Architecture Office for "Mars Ice House," a shelter that would be built of Martian ice and serve as a radiation shield against the harmful cosmic rays of the Martian atmosphere. Phase 2 participants could develop a way to take the Martian ice and use a 3D printer to build the ice into the parts needed to actually make that design. 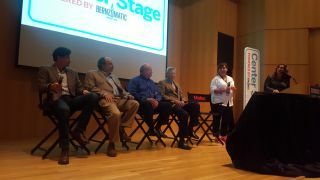 "We started with the dreamers and the drawers," Monsi Roman, Centennial Challenges program manager, said at Maker Faire. "Now we're going to the people who can make things happen." There will be two parts of this phase of the competition, which will happen in fall 2017 and fall 2018 at the Caterpillar training facility in Edwards, Illinois. Caterpillar is just one of the construction companies partnering with NASA on this challenge; others include Brick and Mortar Ventures, Bechtel Corp. and Bradley University's Caterpillar College of Engineering and Technology. NASA is offering $2 million in prize money for this phase of the challenge, and Roman encouraged everyone with an idea to enter. "Come and join us," she said. "Let's just play." The rules for Phase 2 will be released Oct. 7 on NASA's Centennial Challenges website.